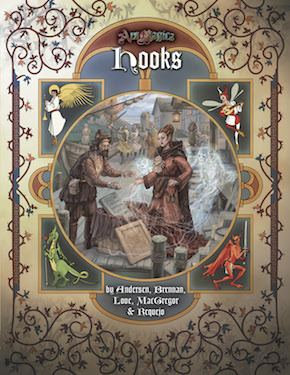 Hooks is an anthology of eight scenarios for Ars Magica Fifth Edition, each of which ties into another Ars Magica sourcebook. They work great as one-shot stories or as a means of introducing new rules to your ongoing saga. This book has arrived at our warehouse and is heading out to stores shortly, so in the meantime whet your group's appetite with this 2-page PDF preview of the Introduction!